We talk frequently about cybersecurity, discussing how to protect your business’s data by using strong passwords, deploying antimalware utilities, and keeping your computers safe with the latest patches and updates. This time, the focus is on premises security, or protecting your business’s physical assets from burglary and vandalism. The best cybersecurity measures in the world are useless if a thief breaks into your office and makes off with your computers. You won’t lose any digital data if you’ve followed our advice to back up your computers to secure, offsite locations; but if your business is like most operations, it isn't entirely digital. You have paper records, including sensitive personal information about your employees. Your business also depends on physical assets—computers, displays, servers, fax machines, and everything that goes with them—that you will need to replace if someone steals them or destroys them. Can you afford that kind of disruption? The latest security systems can not only alert you to a break-in, trigger an alarm, and dispatch law enforcement, but can also provide video surveillance, manage the HVAC (heating, ventilation and air conditioning) system, control the lighting, automatically power down small-office equipment according to a schedule, and in some cases provide access control. Think you can’t afford a security system? You’ll be surprised at how inexpensive these systems can be. I’ll discuss three examples: a do-it-yourself system from FrontPoint Security, a custom-installed system from ADT, and an access-control system from RedCloud that’s designed for a larger company’s IT department to manage. This inexpensive, do-it-yourself security system offers some flexibility. FrontPoint uses a GE Simon XT as its master controller. The device has GSM and Z-Wave modules. If you don’t mind rolling up your sleeves and installing a product yourself, FrontPoint Security sells a remarkably capable yet inexpensive security system. As long as you can mount the control panel near an AC outlet, you won’t need to deal with electrical wiring, because everything else is either wireless or low voltage. Although FrontPoint markets its products and services primarily to homeowners, FrontPoint cofounder Peter Rogers says that 10 to 15 percent of FrontPoint customers are commercial premises such as office spaces, retail locations, and warehouses. You can monitor, arm, and disarm FrontPoint’s systems via any computer, tablet, or smartphone with Internet access (you'll find apps for tablets and for Android, BlackBerry, and iPhone handsets). You can monitor and control the entire system using any standard Web browser. Your facility must be within range of a cell-phone tower, and if you install Internet video cameras, it must have broadband access. FrontPoint contracts with a large SaaS (software as a service) vendor, Alarm.com, for central-office monitoring, but FrontPoint handles its own tech support during setup and for the life of your contract. Would You Like Automation With That? A FrontPoint Security system can be as simple or as elaborate as you’d like. You can discuss your needs with a sales rep over the phone, but every system will include at minimum a wireless control panel and one wireless door/window sensor. Ideally, you should install one of these sensors on each exterior door. The two-piece sensors come with industrial-strength double-sided tape, so all you need to do is peel the backing and stick the sensor pieces in place: One piece mounts to the door, and the other attaches to the door frame. When someone opens the door, the two pieces separate to break a magnetic field, and the sensor sends a message to the control panel. You can arm and disarm the system using a computer, a smartphone, a tablet, or this keychain remote. If the system is armed, the control panel sends an alert to a central monitoring office. (This is where the cell-phone tower requirement comes into play, as intruders can easily compromise security systems that rely on landlines by cutting the phone line outside the building.) The central office then sends you a text alert and email message; more important, a human being calls you or your designated contact. At your direction—or by default if you can’t be reached—an Alarm.com employee will call your local law-enforcement dispatcher. You can also configure the system to send you an alert each time the door opens even if the system is not armed. A system consisting of just the control panel and one stick-on door/window sensor costs less than $300 ($239 for the control panel and $33 for the sensor). In addition to purchasing the equipment, you’ll need to pay $43 per month for central-office monitoring and Web access/control. FrontPoint does not require customers to sign a long-term contract, but the company does encourage such a commitment, as it slices $300 off the price of the equipment in exchange for signing a 36-month service contract. Here's the browser-based user interface for FrontPoint's security system (this screen comes from a residential installation, but a business installation would look the same). In addition to intrusion sensors, a FrontPoint system can accommodate surveillance cameras, lighting controls, keyless-entry locks, a thermostat, motion sensors, and even water sensors (for detecting a burst pipe or a flood). You can tie the cameras, sensors, entry locks, and lighting controls all together at the control panel. 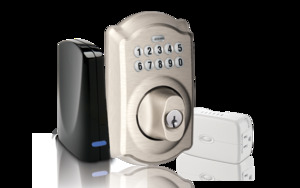 As a result, when someone opens a door using the keyless-entry lock, for example, the lock sends a message to the control panel to disarm the alarm system. A lighting-control module, meanwhile, can simultaneously switch on a light when someone opens a door at night. And you can program the cameras to record a video clip automatically when an alarm event is triggered. The cameras themselves are outfitted with motion sensors, too, which is handy for monitoring access to a particular area of your building. A FrontPoint system consisting of the control panel, two door/window sensors, two indoor night-vision cameras, one motion sensor, one lighting-control module, one in-wall light switch, one panic button, and a thermostat costs $980 (before a $300 rebate). Support for the automation features increases the monthly monitoring fee to $50 per month. If you find yourself forgetting to activate the alarm system, you can configure it to send you a reminder at a specified time, up to seven days a week. Alarm.com also recently added a geo-services feature that can send you an SMS alert reminding you to arm the system when you leave a “fence” (a perimeter around your office that you’ve drawn on an online map) or when you arrive at another fence (a perimeter around your home, for instance). This last feature is currently available only for Android and iPhone smartphones. A FrontPoint indoor night-vision camera. FrontPoint’s systems are best suited to home offices and smaller commercial facilities, because the control panel cannot support more than 39 sensors, and it’s limited to nine unique user codes for arming and disarming. You have a few workarounds, however; you could, for instance, deploy a $65 motion sensor to cover a large area inside your office, instead of mounting sensors on every entry door. You can get around the nine-user limit by providing employees with $30 keychain remotes for arming and disarming the system (although each keychain remote will count against your 39-sensor limit). You can assign each user code and each keychain remote to an individual, and the system tracks log-ins, log-outs, alarms, and all other events so that you have an ongoing audit trail of the activity at your location.